I hadn't really bothered with Chima Lego because I felt my children were too old to get the enjoyment from the 'play' aspect, or too young to be able to put it together themselves, and the only appeal for us adults was a vague sense of nostalgia because of the similarity to Thundercats. Grandma gave us all some vouchers for Christmas, which we went to spend last weekend. In the window was a huge display of Legends Of Chima Lego, this immediately drew our attention and 'in the flesh' we could see it was far more exciting than we'd expected. With the UK release of the Lego Teenage Mutant Ninja Turtles sets still another 2 1/2 weeks away on February 15th it seemed a great idea to have a closer look. We bought 2 sets in the end - 70001 Crawley’s Claw Ripper, and 70115 Ultimate Speedor Tournament. This set has 139 pieces and retails at around £12.99.The recommended age range is 7-14. It has 2 minifigures of Crawley and Leonidas, 1 weapon and the Claw Ripper itself. This is a really excellent working model vehicle.The 'crocodile' theme is fantastic, with an opening jaw and rotating wheels and huge claws which turn as the vehicle moves. The cockpit opens to let the figure sit down, and there is a chest at the back where he can keep his treasure. The minifigures themselves have heads with 2 different faces, plus unique 'masks' that go over them to make the crocodile and lion heads complete. We are really pleased with this model and feel it represents excellent value for money. It is achievable for your average young person to be able to afford, and offers loads of play value. 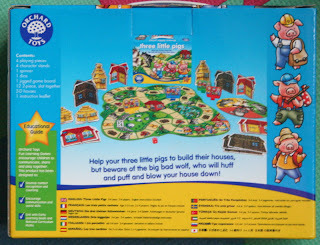 This set has 246 pieces and retails at around £19.99. The recommended age range is 7-12. It has 2 minifigures of the Croc and Lion in full battle regalia, 2 themed Speedors vehicles with rip cords, 4 weapons, 2 torches, a Chi Orb pedestal, 2 Chi orbs, game cards and Chi (jewels) and a large lion themed target with a huge mane. This set has far more going on than you'd realise at first glance. The Chi can be prizes which you win by knocking balls (Chi orbs) from the pedestal or by hitting the target within the lions mouth using your Speedors, or 'lives' when playing the card game. The minifigures and Speedors are really beautifully done, and work really well. They travel very quickly, propelled by the rip cords in such a way that it's really easy for anyone to use them. The way the minifigures sit in their Speedor means that they have never fallen off and are really secure, so you spend hardly any time at all rebuilding after crashes. The target within the lions mouth is really clear and spacious, and you can actually aim and hit it with only a modicum of skill and a little careful judgement. (Because I was playing with 2 young children I replaced the blue plastic Chi orbs with Maltesers to demonstrate on this occasion). We've not yet had a proper game using the game cards supplied, but that will add another dimension to the simpler 'hit the targets' which we have been playing, introducing the idea of a finite number of turns before somebody has won 6 rounds and is announced the winner. I think this set represents good value for money and offers tons of play value, and the 'game' element is easily adaptable for different abilities. The Speedors travel really well and are great fun to play with on their own! Overall we're impressed with Lego Chima. 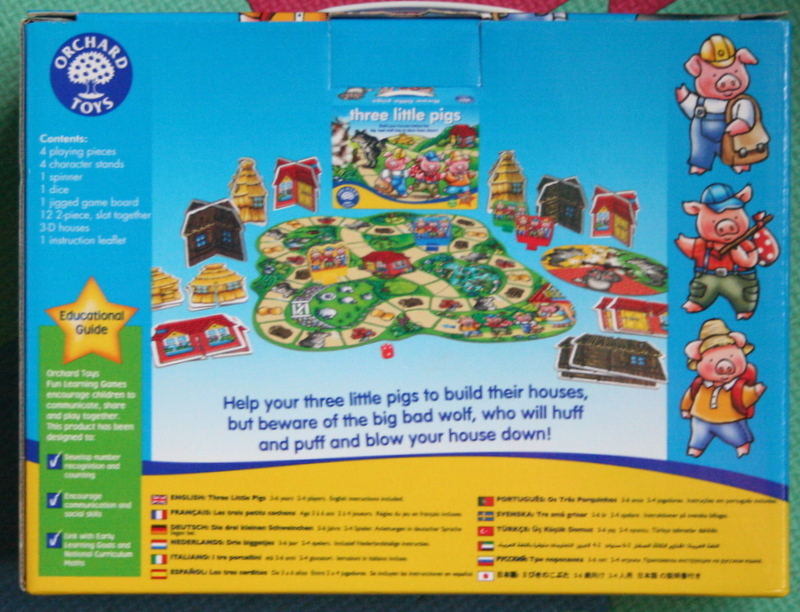 It has several different levels of play available, from the build to the vehicles and characters, through to a very competitive game. It'll certainly keep us busy until the Lego Teenage Mutant Ninja Turtles are available - and I forsee turtles v lions v crocs after February 15th! I hate seeing myself on camera. I think it was summed it up perfectly once on a TV show by Dylan Moran, "did I really get that fat? And I'm not that old". Thing is, I know most people feel like that, and somehow that makes me feel better about it. Video is a whole new dimension of torture, with added movement and sound. You can't just film a little bit of your face, or pose in the best soft light and take 1427 pictures until you find one that's acceptable. Doing review videos has meant that I've had to get over my fear and loathing and get a little used to what I actually look like, rather than the self-image of me at 23 before life and 6 children took their toll. I find it helps if you bear in mind that most people who see it don't know you, and those who do know what you look like anyway (including at the end of the night when you've had a couple or more beverages and your mascara is sliding down your face and your carefully chosen outfit looks like you slept in it). Here's my video application to continue to be a part of the Izziwizzi Kids reviewers panel. Well worth the cringing and the wailing about how frizzy my cloud of hair looked that day (which was in part due to the weather that I'd waited for especially so that I could film the snow). Hopefully It'll all be worth it! If you want to apply then you'd better get your camera/phone/Innotab out sharpish and post your video on the Izziwizzi Kids Facebook wall, fill in the online application form and sit back. Rest assured we won't be laughing at you, we'll just be jealous that you turned the lights down before you started, or had dancing girls and fireworks in your video! 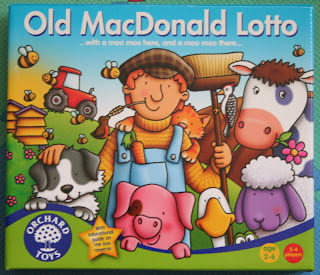 Because we love Orchard Toys games it's no surprise that we asked Santa to bring some for Christmas. 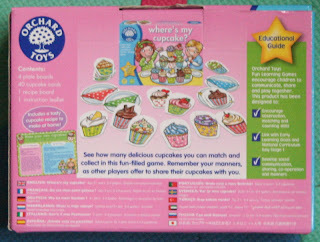 We took advantage of the free postage for orders over £15 and ordered Where's My Cupcake? and What A Performance, which had both come highly recommended at Playfest on Twitter and Facebook. 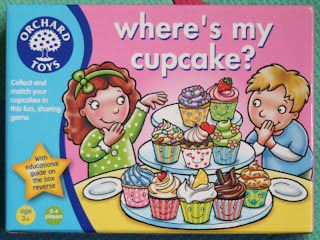 Where's My Cupcake was mainly for boy no.4, who is 3 in March, and What A Performance was for the whole family to play together. As with all Orchard Toys games and puzzles they are designed and manufactured in the UK from strong 100% recycled board. They have really bright colours, modern pictures and chunky pieces that don't bend or come apart during even quite boisterous play. They are built to be played with, and built to last. Where's My Cupcake retails at £7.50. 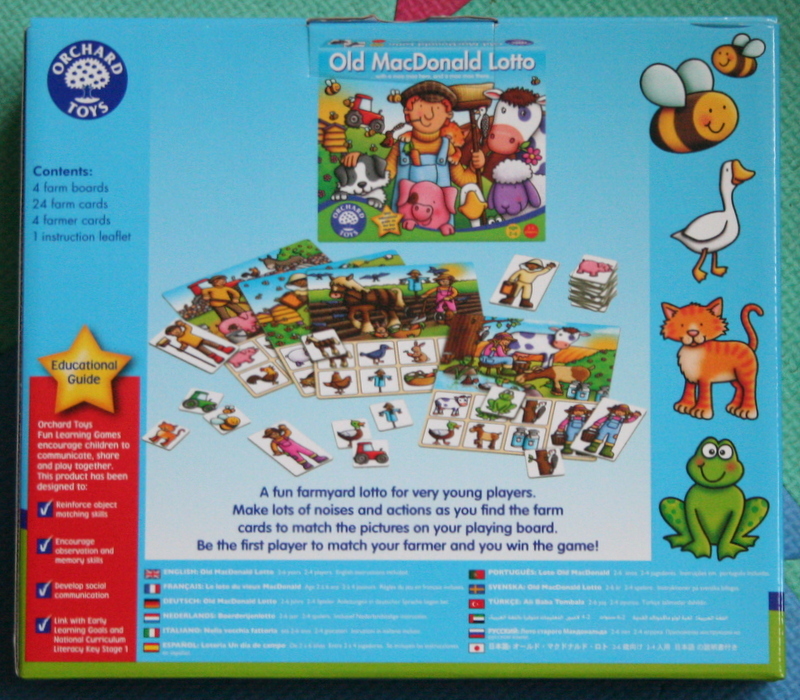 It is suitable for 2-4 players, and the suggested age range is 3-7. 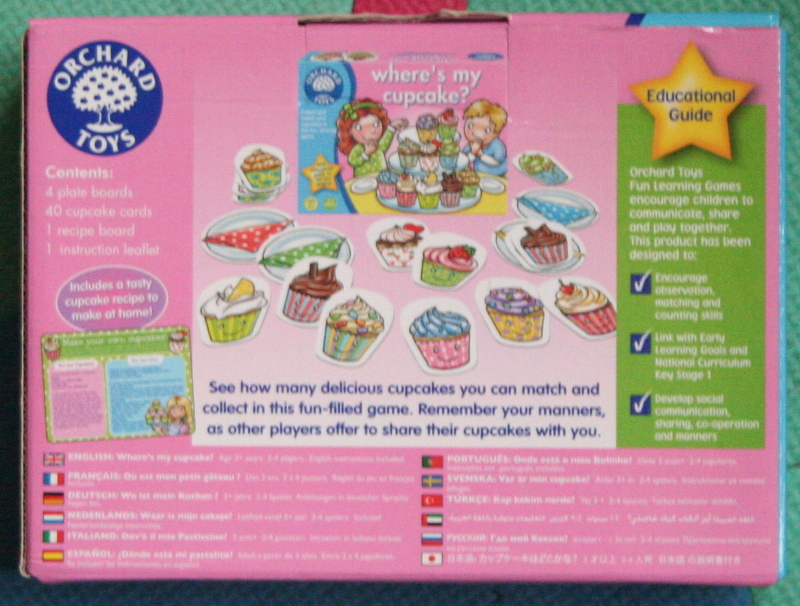 It teaches turn-taking, matching and observation skills, and encourages conversation and politeness due to the quirky and cute "would you like a cupcake?" when you pick up a card that matches another player's top card! My 2 year old loves this game. He understands entirely how to play and is delighted whenever he gets a matching pair of cards. The way the game is played you match cards to any of 10 cards that are first placed on the table, and also to whatever your current top card is on your plate. This means that the numbers of pairs are far higher than 'snap' and the child gets a greater sense of ongoing reward. When the card you pick matches one of the other players top cards then you 'gift' them the card to add to their pile. It's really a very sweet game, which although competitive is also co-operative and friendly. 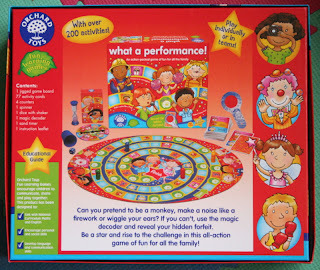 It is very quick and simple to play, making it ideal for children who are just learning to play board games. The cakes are all beautifully drawn and really appetising, with different toppings and icing, so it's fantastic for teaching and reinforcing colours and shapes without even trying. What A Performance retails at £15.95. 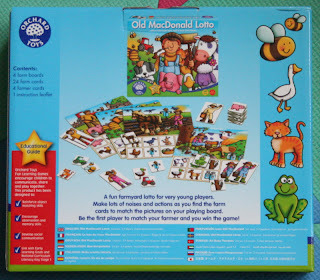 It is suitable for 2-6 players, and the suggested age range is 5-12. It helps with maths, communication and social skills, encouraging active participation and extrovert behaviour within the group. We played in pairs with under 5's and over 12's together, and everyone had a great time. It is very competitive but because everyone has to take part in forfeits and daft actions it's also hilarious. 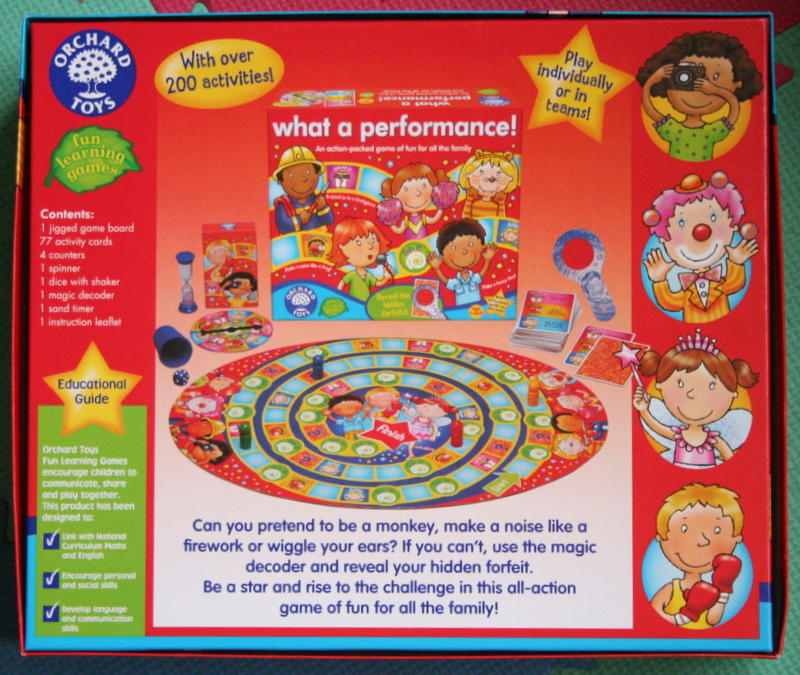 You travel around a board using a dice and landing on squares that mean you have to choose a card and perform the sound, action or task shown. If you fail you have to perform the forfeit. Our older children really got into the spirit of this game and the younger children loved that interaction with their siblings. 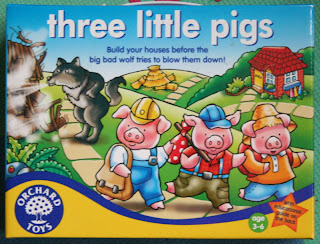 I have to say I really enjoyed it too, watching Daddy and our 2 year old have to sit on their hands until their next turn was brilliant. I bought this game on recommendation and hoping that it would be okay even though my children straddle the age group, and I was not disappointed. It is one of the most expensive games that Orchard Toys sell, but it's easy to see why. 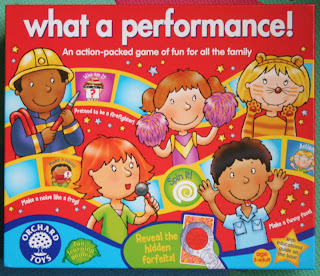 We will make many great memories playing this together as a family, and possibly even in the evenings when the children have gone to bed! 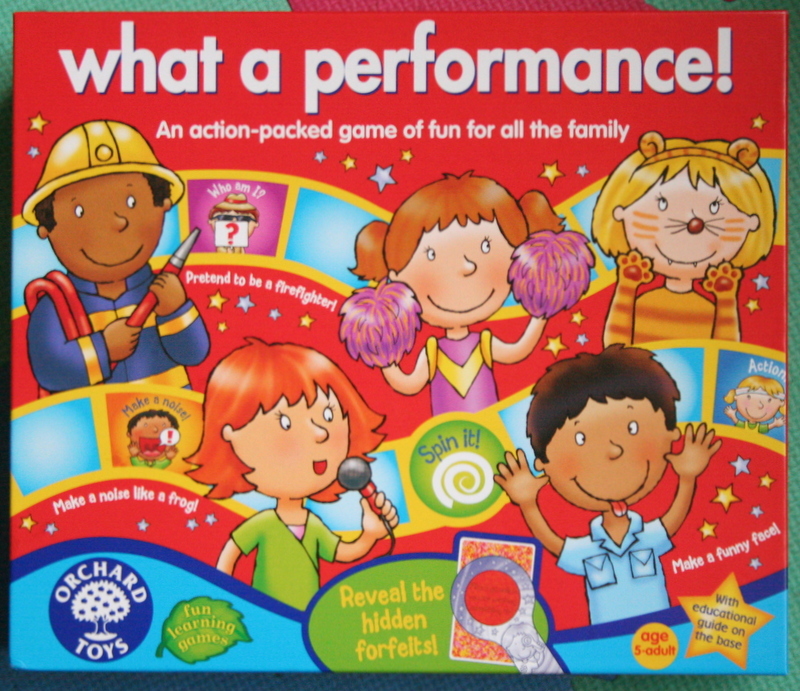 Izziwizzi Kids and Play Fest - Your Chance to be a Reviewer! 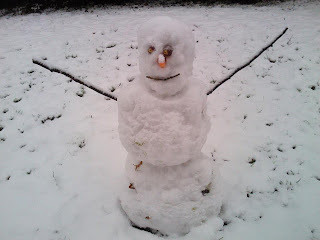 IzziwizziKids.co.uk was born way back in 2005 when Al Boxall-Gordon (a new mum at the time) who was finding world surrounding children, toys and play frustrating. 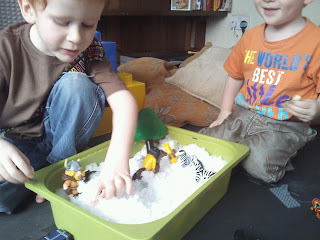 At that time the emphasis on toys and play seemed to be very much centred around what was most profitable, rather than why different types of play were important and stimulating different types of play. And so it was…IzziwizziKids.co.uk was born originally as an e-commerce store, moving into online TV offering alternative toys and gifts that followed a new set of rules. Toys and play should stimulate different aspects of interaction …parent and child, child alone and child with other children. Toys and gifts should not be so heavily disposable. We should take responsibility for the way that toys and gifts are produced (both socially and environmentally) and we opt for good quality and robustness over price. The latest fads are a no go. Everything is centred around what is good for the child and not what is good for the pockets of major corporations. Children using their imaginations and stretching themselves mentally and physically. Since it’s launch, IzziwizziKids.co.uk has featured on GMTV, LK Today, This Morning and Loose Women to name but a few. And although has taken a new direction away from an e-commerces store, with our new direction and focus for the website as an interactive resource, we are now able to offer you even more services than ever. As a result we continue to go from strength to strength. Play Fest is the online meeting and discussion that takes place most Tuesdays 8.30-10.00pm on Twitter using the hashtag #Playfest, and Thursdays 8.30-10.00pm on the Izziwizzi Kids Facebook Page. These discussions are open to anyone to join in and usually offer a chance to win some of the products and toys featured that week. It has become increasingly popular and is now attracting a big crowd and some top names in the toy industry including Lego, Mattel and Brio. Because of the success of Playfest, Izziwizzi Kids is now looking to recruit toy reviewers who will be given training and support and regularly review. They need people who are keen and can turn around video reviews in around a week or so. You don't need to be David Bailey or have equipment better than the BBC, but you need to have children and be interested in play! To apply you will need to submit a 1-2 minute video to the Izziwizzi Kids Facebook Page and a pool of reviewers will be chosen from the applicants. If you've always fancied reviewing but never known where to start, or you just want to join in, why not give it a go? 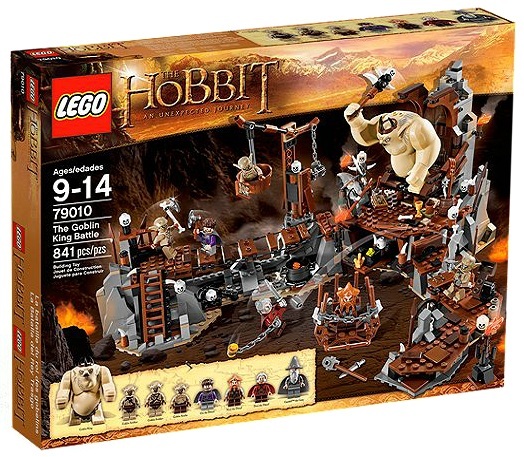 We were incredibly lucky just before Christmas to get the opportunity through Izziwizzi Kids to review the brand new Lego Hobbit set - The Goblin King Battle. When you open the box the bricks are in 5 separate bags, with 3 instruction booklets and a sheet of stickers for special bricks. The instructions are clear, the stickers go on easily, and the bags are not split by type or size of brick, but by area of the build, so each bag builds one aspect. We really liked that, not least because it meant each of our teenagers could choose a part to build, get the correct bag and start. 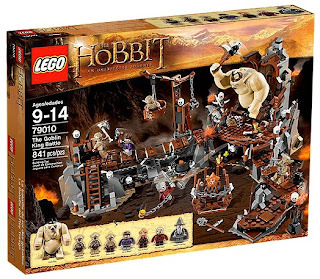 The set has 7 minifigures - including Gandalf, dwarves, goblins and the fantastic goblin king himself. There are loads of loose items including a host of weapons, plus several moving parts with interesting functions. 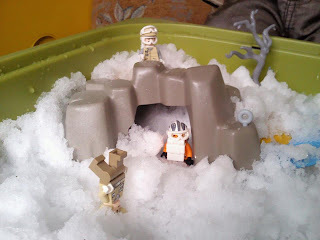 The build is very much a puzzle, and then what you have is a different toy more suited to the younger people within the age range for re-enactment and make believe. This is a HUGE Lego set and all of the children (and adults) were delighted to get a chance to play with it. 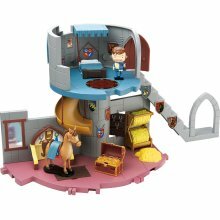 The suggested age range for this set is 9-14years, and with a build time of several hours and 841 pieces, many of which are non-standard, you can see why. The design is fascinating and really intricate, there is barely a straight line in the entire build. It has so much more going on than we had expected, went together and stayed together well. There are also lots of intricate moving parts and functions including a bucket crane which turns and lifts/lowers, a rope bridge which collapses and a firing catapult. This set has an RRP of £79.99, which we feel is a fair and standard price for a set of this size. I actually think that compared to most very large themed Lego sets, this set is more in line with some of the more modern sets like the Monster Hunters and Ninjago, and is better value, as it provides a huge amount of play opportunities rather than being more of a static model once completed. We were very impressed with the Lego The Goblin King Battle. A side effect we hadn't forseen was that after spending half the afternoon building together, our 3 teenagers actually chose to all watch a movie together and didn't stop talking for the rest of the day - it was a real team-building exercise! A definite thumbs up! We were lucky enough to be sent this set to review, but the opinions and reviews are our own genuine thoughts.